Uh oh. This marks my halfway mark to bento #400. My back is aching just thinking about it. 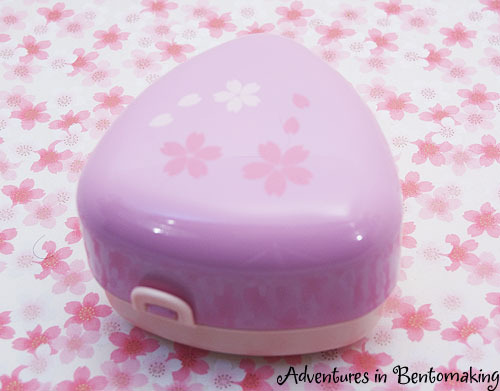 If you haven’t heard, I’m hosting a giveaway sponsored by Zojirushi for a Ms. Bento thermal lunch jar. Entering is easy, just comment with a meal plan! Today’s blog plug is for Iris from the Netherlands, who bentos in part to help get Dutch people more enthusiastic about bento. 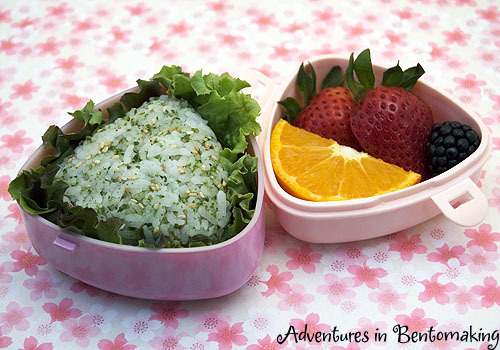 Her blog, Bento Babe, isn’t in English, but she encourages you to read it using the Google translator. Iris has a great talent in arranging her vegetables into nice patterns and also has an adorable bear face punch that I so wish I had! Today I’m stuck at home with a germ-ridden, cold-infested Buddy. GET ME OUT OF HERE! Oh, did I say that out loud? I meant… Today I’m happily at home watching Buddy. The poor lil guy is sick, so I am at home giving him lots of love and sunshine… provided he stops yelling at me to go to the doctor an hour and a half early (there were no appointments for me yesterday. Anyway, I’ve made a little snack for us to take with us since he refused to eat anything this morning besides two bigass spoons of peanut butter. The box I’m using today is a sakura onigiri box from J-List. It’s just the right size for a triangle shaped onigiri and also has a small compartment for you to add something extra like veggies or pickles or as I did, fruit. I didn’t have much leftover rice, so the onigiri I made didn’t fill up the whole space. To help it look a little nicer I added some red leaf lettuce to the box. This is the box all closed up. There’s a little inner layer to separate the onigiri from the little compartment I put the fruit in, so this makes for a really great snack carrier, which is what I consider a yummy onigiri to be without any meat. An onigiri can be such a great mid-morning snack when you ate an early breakfast and don’t think you can make it to lunch. It snaps shut on two sides, providing a pretty secure box. Still, I wouldn’t put anything really juicy in there. It’s so small that I’m going to just carry it in my purse and I certainly don’t need it leaking. I added Nori Komi furikake to the onigiri to make it tastier and to match the lettuce. In the other compartment I added two strawberry halves, a blackberry, and a quarter mandarin orange. I ate the rest of the orange. Thanks to everyone for the well wishes about my finger! It feels much better today!